Review by AllTheBestFights.com: 2018-04-21, pretty good fight between Frankie Edgar and Cub Swanson 2: it gets three stars. The black belt in Brazilian jiu-jitsu and former Ufc Lw champion Frankie Edgar entered this fight with a pro mma record of 22-6-1 (50% finishing rate) and he is ranked as the No.4 featherweight in the world (currently the #1 in this division is Max Holloway) while his opponent, the black belt in Bjj and judo Cub Swanson, has a record of 25-8-0 (60% finishing rate) and he entered as the No.13 in the same weight class. Both fighters have lost their last bout with Brian Ortega (Frankie Edgar vs Brian Ortega and Cub Swanson vs Brian Ortega). Before losing Edgar had beat Yair Rodriguez (Frankie Edgar vs Yair Rodriguez) while Swanson won over Artem lobov (Cub Swanson vs Artem Lobov). 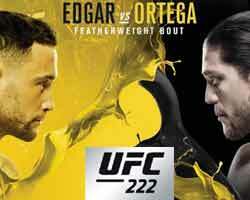 In their first fight Edgar had beat Swanson by submission (November 22, 2014 – Frankie Edgar vs Cub Swanson I); this second fight is on the undercard of Edson Barboza vs Kevin Lee – UFC Fight Night 128. Watch the video and rate this fight! Review by AllTheBestFights.com: 2017-05-13, good fight between Frankie Edgar and Yair Rodriguez: it gets three stars. The black belt in Brazilian jiu-jitsu and former Ufc Lw champion Frankie Edgar entered this fight with a professional record of 21-5-1 (48% finishing rate) and he is ranked as the No.3 featherweight in the world. He fought twice last year losing to current #1 Fw Jose Aldo (=Edgar vs Aldo 2) and beating Jeremy Stephens (=Edgar vs Stephens). His opponent, the black belt in tae-kwon-do and Tuf Latin America Fw winner Yair Rodriguez, has a mma record of 10-1-0 (50% finishing rate) and he entered as the No.26 in the same weight class. ‘Pantera’ Rodriguez suffered his only loss when he faced Luis Roberto Herrera in 2012, since then he has won eight consecutive bouts beating Alex Caceres (=Rodriguez vs Caceres) and BJ Penn in his last two (=Rodriguez vs Penn). 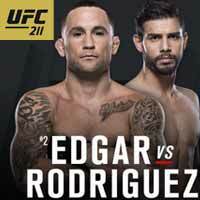 Frankie Edgar vs Yair Rodriguez is on the undercard of Stipe Miocic vs Junior dos Santos 2 – UFC 211. Watch the video and rate this fight! Review by AllTheBestFights.com: 2016-11-12, great performance by both fighters: Frankie Edgar vs Jeremy Stephens gets three stars. The black belt in Brazilian jiu-jitsu and former Ufc Lw champion Frankie Edgar entered this fight with a professional record of 20-5-1 (50% finishing rate) and he is ranked as the No.3 featherweight in the world (currently the #1 in this division is Conor McGregor). He fought twice last year beating Urijah Faber (=Edgar vs Faber) and Chad Mendes (=Edgar vs Mendes) but then he lost to Jose Aldo in 2016 (=Edgar vs Aldo 2). His opponent, Jeremy Stephens, has a mma record of 25-12-0 (76% finishing rate) and he entered as the No.9 in the same weight class. He was defeated by Max Holloway in 2015 (=Holloway vs Stephens) but he came back to win in 2016 against Renan Barao (=Barao vs Stephens). Edgar vs Stephens is on the undercard of Eddie Alvarez vs Conor McGregor – UFC 205. Watch the video and rate this fight! Review by AllTheBestFights.com: 2016-07-09, some good single shots between Jose Aldo and Frankie Edgar but it is not enough to get three stars: it gets two. The black belt in Bjj and former Ufc Lw champion Frankie Edgar entered this fight with a mma record of 20-4-1 (50% finishing rate) and he is ranked as the No.2 featherweight in the world (currently the #1 in this division is Conor McGregor). He suffered three consecutive defeats between 2012 and 2013, the last one against Jose Aldo in their first bout (=Aldo vs Edgar I) but after this fight he has collected five victories beating Urijah Faber (=Edgar vs Faber) and Chad Mendes in 2015 (=Edgar vs Mendes). His opponent, the black belt in Brazilian jiu-jitsu and former Ufc Fw champion Jose Aldo Junior, has an official record of 25-2-0 (64% finishing rate) and he entered as the No.4 in the same weight class but he fought just twice in the last 24 months beating Chad Mendes in 2014 (=Aldo vs Mendes 2) and losing to Conor McGregor in 2015 (4-stars-fight, Aldo vs McGregor). 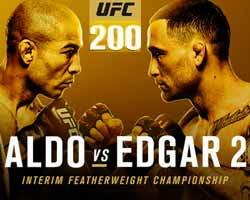 Edgar vs Aldo 2 is valid for the interim Ufc featherweight title; undercard of Miesha Tate vs Amanda Nunes – UFC 200. Watch the video and rate this fight! Review by AllTheBestFights.com: 2015-12-11, Frankie Edgar vs Chad Mendes gets three stars thanks to a good finish (UFC Performance of the Night). The black belt in Bjj and former Ufc lightweight champion Frankie Edgar entered this fight with a pro record of 19-4-1 (47% finishing rate) and he is ranked as the No.2 featherweight in the world. He suffered three consecutive defeats between 2012 and 2013, the last one against #1 Jose Aldo (=Aldo vs Edgar) but after this bout he has won four fights beating Urijah Faber in 2015 (=Edgar vs Faber). His opponent, Chad Mendes, has an official mma record of 17-3-0 (53% finishing rate) and he entered as the No.6 in the same weight class but he lost two out of his last three fights, against Jose Aldo in 2014 (=Aldo vs Mendes 2) and Conor McGregor in 2015 (=Mendes vs McGregor); between these two bouts he won over Ricardo Lamas (=Mendes vs Lamas). Edgar vs Mendes is the main event of “The Ultimate Fighter 22 Finale: Team McGregor vs Team Faber” – UFC. Watch the video and rate this fight! 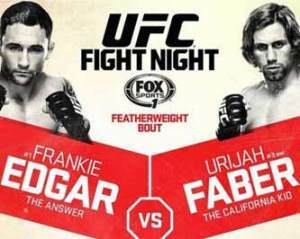 Review by AllTheBestFights.com: 2015-05-16, some good single shots between Frankie Edgar and Urijah Faber but it is not enough to get three stars: it gets two. The black belt in Bjj and former Ufc Lw champion Frankie Edgar entered this fight with a professional mma record of 18-4-1 (50% finishing rate) and he is ranked as the No.2 fetherweight in the world. He suffered three consecutive defeats between 2012 and 2013, the last one against #1 Jose Aldo (=Aldo vs Edgar) but after this bout he came back to win beating Charles Oliveira (=Edgar vs Oliveira), BJ Penn (=Edgar vs Penn 3) and Cub Swanson (=Edgar vs Swanson). His opponent, the former WEC Fw champion Urijah Faber, has an official record of 32-7-0 (81% finishing rate) and he entered as the No.3 bantamweight. He fought three times last year losing to Renan Barao (=Barao vs Faber 2) but then he has won over Alex Caceres (=Faber vs Caceres) and Francisco Rivera (=Faber vs Rivera); ‘The California Kid’ returns to the featherweight division in this bout. Edgar vs Faber is the main event of UFC Fight Night Manila – Ufc FN 66. Watch the video and rate this fight! 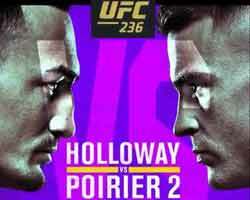 Review: 2014-07-06, pretty good fight between Frankie Edgar and BJ Penn: it gets three stars. The black belt in Bjj and former Ufc lightweight champion Frankie Edgar entered this fight with a professional mma record of 16-4-1 (44% finishing rate) and he is ranked as the No.2 featherweight in the world, he moved down in this division last year but he lost the title shot against #1 Jose Aldo (=Aldo vs Edgar); after that bout he defeated Charles Oliveira (=Edgar vs Oliveira). His opponent, the Brazilian jiu-jitsu world champion (in 2000) and former Ufc lightweight and welterweight champion BJ Penn, has an official record of 16-9-2 (81% finishing rate) but he is not ranked as he hasn’t fought since December 8, 2012 when he was defeated by Rory MacDonald (=Penn vs MacDonald). In both their previous bouts Edgar defeated BJ Penn by unanimous decision (in 2010); this third fight is the main event of “The Ultimate Fighter 19 Finale” – UFC Tuf 19. Watch the video and rate this fight! Review: 2013-07-06, good fight and good pace between Frankie Edgar and Charles Oliveira: it gets three stars (UFC Fight of the Night). Frankie Edgar (15-4-1, 47% finishing rate) entered as the No.2 featherweight in the world while Charles Oliveira (16-3-0, 94% finishing rate) entered as the No.33. Edgar vs Oliveira is on the undercard of Anderson Silva vs Chris Weidman – UFC 162. Watch the video!